Home / home / Will Tidying Up Change Our Lives? Earlier this year the internets were abuzz with discussions about “The Life Changing Magic of Tidying Up” by Marie Kondo. You missed that train? Yeah. Me too. Last week though, Tony and I were talking about having too much stuff. He had seen the aforementioned book, heard the buzz, and told me the tagline was something like “The Japanese art of decluttering and organizing”. As soon I heard “the Japanese art of…” my ears perked up like a kitten hearing a shaking bag of cat-cereal. I imagined our living space as a minimalistic oasis of Zen tranquility. I thought how much easier it would be to maintain our space, and even move, if I had less stuff. I was sold. Even though I’m a chronic procrastinator, Tony is more once a decision is made execute the plan immediately, so we bought the book and started the process the next day. A lot of the organizational advice I’ve read in the past focuses on numbers. How many shirts is it OK to own? How many months should you keep an unworn item? How often should you re-assess your belongings? 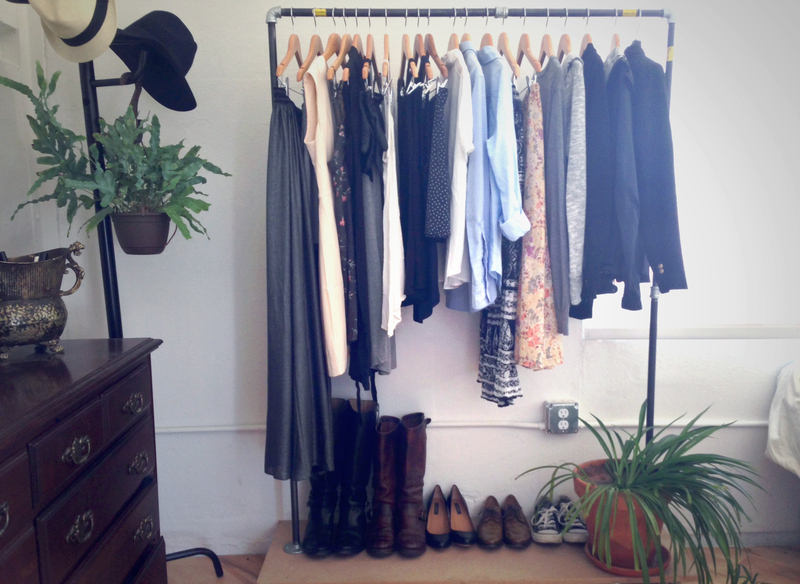 The Life-changing Magic of Tidying Up takes a radically different approach. The author, Marie Kondo, calls it the KonMari Method. Instead of a prescription for when to tidy, what to keep, and where to keep it, she outlines a method for choosing only those items that “spark joy” in your heart. I won’t go into the entire method because you should really just read her book. But, there were some pieces of advice that I think are worth sharing here. Only keep items that spark joy in your heart. There are very few exceptions to this rule such as important documents or completely utilitarian items you truly need but don’t thrill you. Generally though, if you pick up an item and it doesn’t make you happy, don’t keep it. Don’t feel guilty about – and subsequently keep – those items you bought but never used. Thank them for teaching you that you didn’t really need them, then remove them from your life. Don’t downgrade clothing to “lounge wear” or give it to relatives as an excuse to keep it in your life. Your lounge wear (gym clothes, sleeping clothes, etc.) should spark joy in your heart as much as anything else. As for your family, they probably don’t want your old stuff either -unless they do, in which case give them your old stuff. Items don’t have to serve a particular purpose to be kept. You can keep a book you’ll probably never read again or a T-shirt you haven’t worn in years if picking it up gives you special joy. The bit about getting rid of items you’ve never used really spoke to me. I always get stuck in this spiral of guilt when I own something I don’t use. Looking at these items makes me feel frivolous, impulsive, and wasteful. And when I go to give the thing away I feel a responsibility to make that thing useful to me before anyone else can have it. Like if I spent money on something – no matter how long ago – I need to squeeze an equivalent value of use out of it. The KonMari Method made me realize I don’t have to feel guilty about not keeping something I don’t use if it doesn’t give me joy. If I made a decision to buy something that ends up not being used, I don’t need to punish myself by looking at it in my closet every day. Its purpose was served by letting me know definitively that I would not use it. That’s its value. Once its purpose is served I can thank that item for teaching me that lesson, and let it go without guilt. Now, I’m not going to start buying random stuff for the hell of it then immediately discard it because it’s served its purpose. I would still find that incredibly wasteful. But when I make a thoughtful purchase, I don’t have to beat myself up about it when it’s time to decide that thing doesn’t really belong in my life. Tony and I made it through all of our clothes and books, and a closet full of miscellaneous items. There’s still my office area, the kitchen, and the bathroom to be done. Hopefully we can get those taken care of in one more day. For me, this process was liberating. I felt like I was given permission to love the things I love, and to get rid of a lot of things that weigh me down. My Mr. Musta glasses holder has no sentimental value. And it doesn’t do a better job of holding my glasses than just setting them on the nightstand. But looking at it tickles me pink, so I don’t feel bad about keeping it. A T-shirt from our trip to Africa makes me feel guilty every time I see it because I don’t wear it. Keeping it wasn’t doing me any good so I gave myself permission to donate it. I think Tony’s experience was a little different. Objects do not give Tony joy. People and experiences do for sure, but the only objects I’ve seen with the power to make Tony smile are photos of said people and experiences. In Richmond it’s considered “socially appropriate” to wear clothes, so he had to fall back to whether or not clothing and other items had utility. I think that’s OK, and he still got a lot of use out of the book. He liked the idea of not downgrading clothing to lounge wear, and the section on books helped him decide to donate/sell a lot of books he doesn’t really need. On the surface you might not notice that we have fewer belongings, or that the closet and dresser have been reorganized, but it feels so much better in our apartment knowing that those things have been done. There’s more space on my garment rack for my clothes to breathe. I don’t have to sift through twenty T-shirts I never wear to find the five I have on heavy rotation. And I don’t feel a daily pang of guilt when I open a drawer and find things I bought but don’t wear. The best part is looking around my living space. It’s punctuated by things I really appreciate – things that spark joy in my heart. The experience isn’t watered down by things I have no feelings for, or worse, things that I just don’t like. I didn’t realize how many things I had kept – sometimes for years – that brought me no special joy. They were filling closets, my visual field, and my mind with completely unnecessary clutter. The damage has already been done by spending money on something that doesn’t bring me joy. What good does it do to keep those things in my closet? I’m really excited to get the rest of our apartment tidied up. Once we’re done, I think I’ll give the book another read to commit it to memory. Then in true KonMari fashion, I’ll give it away too. Is that Wilted Greens? He looks well. I have to say, this was the most interesting thing I read this hot July day. I’d like to read the book so feel free to send it to the Farm when you’re done, if you are so inclined. I am still thinking on this, but it think attributing joy to individual items– and I’m on board with using joy as a unit of value– and making keep/pitch decisions based on items at a point in time, e.g., today, can short-change the bigger life picture. Again, I’m thinking this through but here’s an example of where my cluttered brain is going. I zoomed in on that second photograph and I’m pretty sure that odd-ball floral skirt on your rack is one I made years and years ago. It’s a great, fairly well-made skirt (but as I recall it does not have French seams). And there it is– 25-30 years or more later?– on your rack on your blog for all the world to appreciate– not to mention it apparently gives you joy. Now, what would have become of that skirt if I had looked at it long ago and said, “You know, you were a great skirt. I made you. But I don’t feel guilty donating you because the joy you give me has diminished. You just don’t do it for me anymore. You’re outta here!” ? The Whole Entire World would have been deprived of that photograph of that skirt on that rack. Not to mention that you wouldn’t have it to enjoy. The thing is, there’s no calculation. It’s a Boolean. Joy or no joy. And it’s your joy, not someone else’s. Can anyone predict potential joy, especially the potential joy of a person that might not even exist yet? If you could predict that I would love that skirt, maybe that actually would fall under the category or “sparks joy”. If you had known that I would love a skirt you made all these years later, that would make you happy right? But I imagine you kept that skirt because it meant something to you. When I was little and I saw it hanging in your closet I knew it was special because you treated it differently from your other clothes. I’ve seen my sisters wear it and treat it with the same love. I imagine they loved it because they could tell you loved it too. Now as it hangs on my garment rack, it gives me so much joy because I know you made it and it was special to you. It reminds me of you, and my sisters. It reminds me of our old house, and watching you sew when I was little. If it was some old thing off the rack that you didn’t even like that much, I doubt I would feel the same way about it. I think she actually does touch on potential joy in the book, but I can’t find it right now. I’ll make sure the book finds its way to the farm when I’m done with it.